Laughed at Dumpty, broken in pain. Will you save? 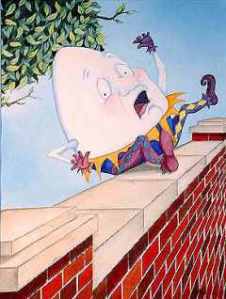 Humpty asked in his pain? My shell it is cracked and also my brain. If nothing is done by horse or by man. My time will be gone from nursery rhyme land. Felt sorry for laughing at the egg in his pain. They stuck him together though ever so cracked. The first daffodils of Spring in my garden today, 4th January 2018 – lovely.